In the past five years, the Philadelphia Phillies have won five NL East titles, two National League pennants, and one World Series. Now they have a chance to add a new honor: worst offense in the league. 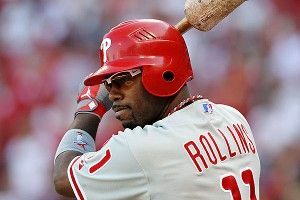 Placido Polanco’s hand injury over the weekend leaves Jimmy Rollins as the only healthy member of Philly’s infield. This is particularly troubling, given that infield has been the team’s primary strength for much of its five-year run. Ryan Howard has banged 262 homers in the past six years, with an MVP award along the way. Polanco has been a consistent three-win player, combining good contact with stellar defense at third. Chase Utley was a better all-around player than either Howard or Rollins in his prime. All four are well past their peak now, yet remain among the team’s best players. With Howard out until at least June, Utley’s status completely up in the air, and Polanco out for most of the rest of spring training (for now), the Phils might have to make do with a skeleton crew. Baseball Prospectus’ PECOTA projection system forecasts the Phillies to score just 674 runs (under 4.2 per game), fewer than any other team in the East and 30 fewer than the fourth-place Nationals. It’s worse than that, though. Of the teams outside the East expected to be more offensively anemic, all but two (the lowly Pirates and really, really bad Astros) play in significantly tougher parks for hitters. Bill Petti has done some fascinating research on park effects, and found they might not have as much predictive value as we’ve thought. Still, unless park effects tell us the exact opposite of the truth, the Giants (640 projected runs), Dodgers (631) and Padres (631) are ticketed to rival or even surpass the Phillies’ offensive output, after adjusting for the dampening effects of those California parks. The temptation is to lay the blame at GM Ruben Amaro Jr.’s feet. Like the rest of the world, Amaro watched Howard crumple in a heap at the end of last fall’s LDS, suffering an Achilles injury sure to knock him out for a significant part of 2012. He knew that Utley had missed 106 games over the past two seasons, and that his ailing knee had turned him from an eight-win superstar into a merely very good four-win player. More broadly, he had to know that players advancing in their 30s are most likely to decline, maybe hold steady in a best-case scenario. But Amaro started shoving his chips into the middle of the table two years ago, digging deep into his farm system to trade for Roy Halladay. He did the same mid-season last year, snagging Hunter Pence from the Astros. No one’s complaining about those moves, let alone Cliff Lee’s free-agent deal (reportedly less than Texas or the Yankees offered) or Halladay’s three-year, $60 million steal for the ages. But all of that prospect dipping has come at a price, with no dynamic heir apparents standing by to spell Howard, Utley, and company. Amaro’s made an honest run at acquiring depth, grabbing Ty Wigginton and Jim Thome to cover first and make up some lost offense, respectively, in Howard’s absence. But it might not be enough. The three biggest motivating factors for free agents are typically money, a chance to win, and a chance to play a lot. Injuries and age, or not, many useful veterans won’t want any part of backing up someone of Utley’s stature, or even Polanco’s. Thus the Phillies’ Plan B at second is 22-year-old banjo hitter Freddy Galvis (ZiPS projects him to hit a brutal .261/.299/.359) and at third…if you’ve played some Little League, give Amaro a call, is all I’m saying. Rany Jazayerli made his triumphant return to Grantland Tuesday with a piece breaking down the Nationals’ chances of winning the NL East, given the Phillies’ injury and age woes. It’s not the first time Rany has predicted imminent doom for the Phils, triggering a wave of fist-shaking from Philly fans that caused the good doctor to move his dermatology practice to rural Bulgaria. Color me … not as bearish. Yes, the entire infield is a concern. Shane Victorino is coming off a possible career year and might be ripe for regression. The ever-reliable Chooch Ruiz is 33 years old. And young outfielders John Mayberry and Domonic Brown, while owning a modicum of upside, aren’t likely to go Brett Lawrie or Desmond Jennings on the league. It still might not matter. Use whatever attempts at logic you want to explain away last year’s 102 wins (expected record based on runs scored and runs allowed was 103); the bottom line is this team was and is built on outrageously great starting pitching. Halladay, Lee, and Cole Hamels are great bets to vie for Cy Young honors again this year — if anything, Hamels’ trends suggest another possible step up this season. Vance Worley got dismissed as a fluke, but he struck out batters at a higher rate than Hamels and a similar rate to Lee. Even a healthy Joe Blanton projects as a league-average pitcher, a great luxury to have in a fifth starter, assuming the Phillies don’t dump his salary. That’s not all. The Phillies may have overpaid for Jonathan Papelbon, but they got last year’s second-most valuable relief pitcher in doing so, with Papelbon delivering nearly twice as much value as the already solid Ryan Madson. The pen isn’t as deep as some other contenders’ ensembles, but no other starting staff gobbled up more innings than the Phillies last year, and they figure to rank near the top of the league again even with Roy Oswalt gone. And of the few prospects Philly has near major league-ready, fireballing righty reliever Phillipe Aumont might be the best bet to make a significant impact this season. Throw in a full season for Pence to prop up his less capable teammates, and this team is still going to win a bunch of games. Though the Nats and Marlins upgraded their pitching this off-season, they still can’t touch the Phillies’ rotation. There don’t figure to be any elite offenses in this division either. In fact, no other team in the East, by any major projection system, is expected to win 90 games this year. Meaning we could get a bunch of nights where Ty Wigginton bats cleanup, Freddy Galvis prompts opposing managers to not even bother playing an outfield, the rest of the team hobbles out to their positions like the Tea Totallers … and the Phillies still win a sixth straight crown.